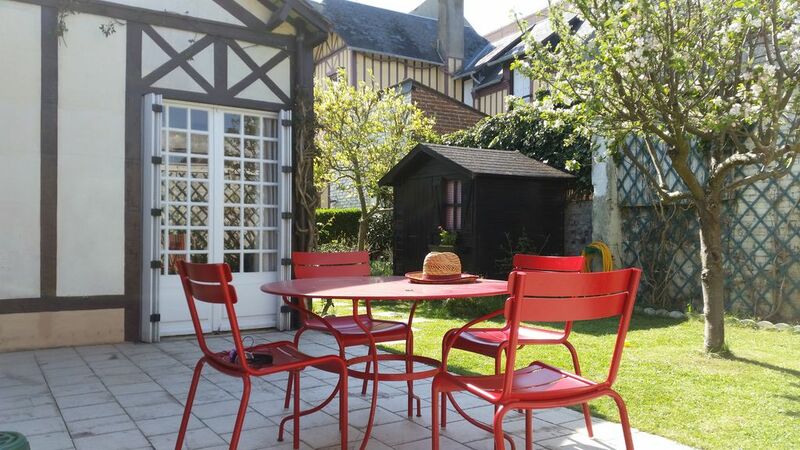 Pretty Normandy house 50 meters from the beach in the garden of the former Grand Hotel Norman early twentieth century "Hotel Parisians" in any particular Oscar Wilde lived in 1897. The house has 2 bedrooms (1 bedroom with double bed, 1 bedroom with 2 separate beds), a large living room, a kitchen, a separate bathroom and toilet and an enclosed garden. The living room and bedroom has a French window overlooking the garden. Site of the tourist office of Villerville. Villerville is a seaside resort located on the Côte Fleurie, between Trouville-sur-Mer (4 km) and Honfleur (7 km). The beach is within 100 meters of the house and has a lovely café with terrace. The proximity to the beach, shops and restaurants makes this resort an ideal place for a family holiday. The village has a baker, a supermarket, 5 restaurants, a post office, a doctor, a pharmacy, a hairdresser, an antique shop, a bar tobacco newspapers and a small library. maison bien conçue et agréable. faites attention à la femme de ménage! Elle est de mauvaise foi et rechigne sur le travail et met les gens à la porte! train to the station of Trouville / Deauville then bus to Villerville.